Concentrated source of high-fat energy, rich in antioxidants and direct-fed microbials. 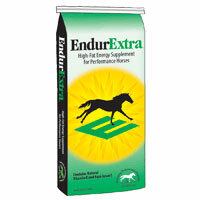 EndurExtra is the perfect choice for hard keepers, top performance horses, and seniors. 50% fat in a blend including Equi-Jewel® rice bran, soybean oil, and flax. 25lb bag is a 50 day supply for one horse.